The Convention on the Rights of Persons with Disabilities (CRPD) was adopted in December 2006 and came into force in May 2008. 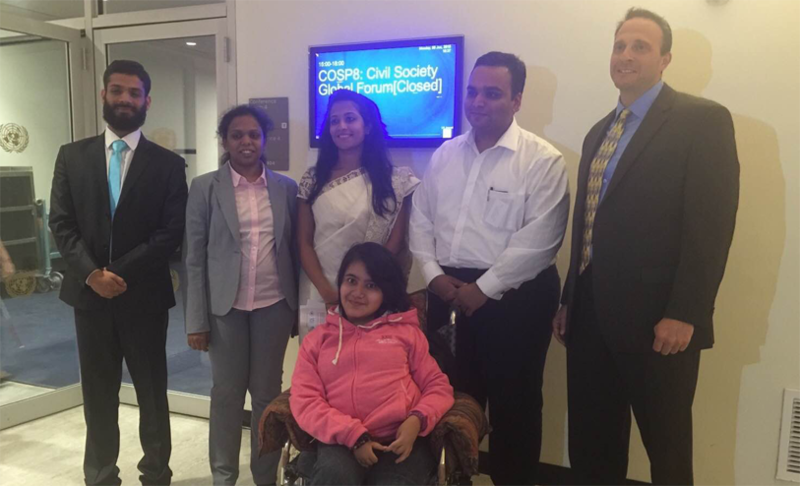 Since then each year the countries that have ratified the CRPD, meet at the United Nations in New York to discuss its implementation in their respective countries. This event is called the Conference of States Parties (CoSP). Also, a day before the CoSP, an entire day is dedicated to the Civil Society who organize the Civil Society Forum (CSF). This Forum is an opportunity for DPOs, NGOs, Member States, UN agencies and other relevant stakeholders to discuss and debate issues related to the rights of persons with disabilities from a civil society standpoint. Addressing the need of lack of perspective of youth with disabilities from the Global South at international platforms, NCPEDP facilitated the participation of 5 young men and women with disabilities (students and working professionals) from India at the Forum and at various side events at the United Nations. This was made possible due to a generous grant given to us by The Hans Foundation.